We are entering a new phase of our Quilt Shop Life. With this new website, we now have on line shopping. More items will be added daily. We ask for your patience and understanding as we update the site and add to it going forward. 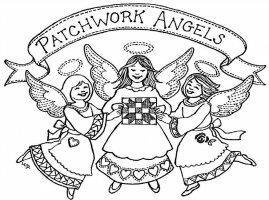 If there are updates you would like to see us prioritize, feel free to drop an email to Info@PatchworkAngels.com and we will accommodate you as best we can. We won't promise how frequently we will add blog updates, but we will try to communicate as often as we can make the time and have something to share.